My local Red Cross hosts a charity auction every year and has artists in the community decorate objects that are displayed in downtown Jackson for 3 months and then raffled off. In the past they have had giant fiberglass elephants, cars, scarecrows, and bird baths. 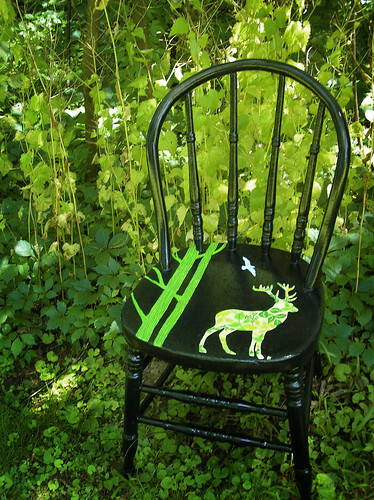 This year they are calling it a “chairity” event where artists can paint chairs, benches or stools. The seating art objects will be on display from July 30th until the first week in October. The Red Cross and the Armory Arts will be hosting the auction and a coinciding gala event in the middle of October. I bought an old antique chair in Lansing, that the antique dealer said, “people pay good money for chairs in this bad of condition!” and couldnt believe I was going to paint over the original finish- which was this awful yellow cracked and peeling paint. It was begging for a facelift! Unfortunately I didn’t take a “before” photo. My idea of Environmental Subconsciousness came from the wave movement of people obsessed with “going green”. 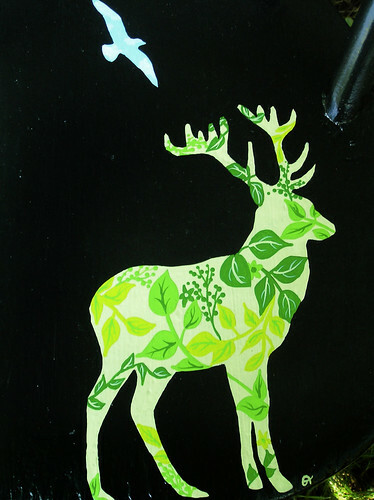 The deer silhouette filled with leaves and plants represents animals that are affected by humans. The bird filled with sky represents our depleting atmosphere, and the green trees represent the strength for change. Hopefully someone will want to showcase this in their home and it brings a lot of money to the Red Cross. It was a fun project! 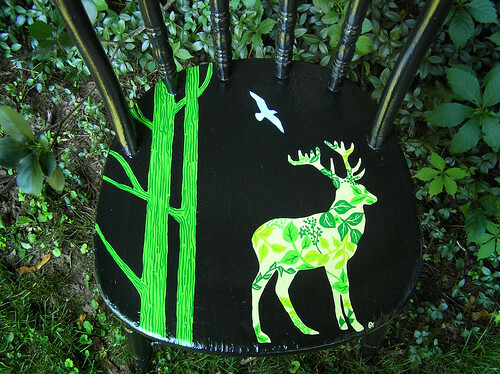 What an awesome chair! I love the artwork and the symbolism, but I really hope that “going green” isn’t the trend you’re suggesting it is. Either way, the artwork is gorgeous! And congrats on hitting Renegade! I’m totally jealous!